Leadership is not about job titles—it’s about action and behavior. “Sparks” are the doers, thinkers, innovators, and key influencers who are catalysts for personal and organizational change. But these extraordinary individuals aren’t defined by the place they hold on an organizational chart—they are defined by their actions, commitment, and will. 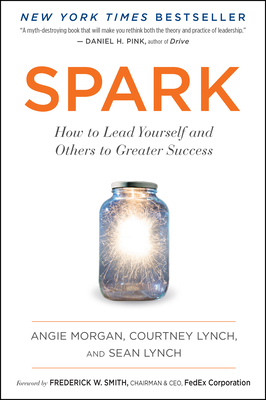 Leadership experts Angie Morgan, Courtney Lynch, and Sean Lynch show how you can become a Spark by cultivating seven key leadership behaviors. Grounded in the latest research on leadership development, this fresh, accessible road map is packed with real-world stories from inside companies like Facebook, Google, and Boston Scientific, and from the authors’ own high-stakes, challenging experiences serving in the U.S. Armed Forces. With SPARK as a blueprint, anyone can become a catalyst for change, and any organization can identify and develop Sparks. Courtney Lynch and Angie Morgan are the co-founders of Lead Star and co-authors of the best-selling business book Leading from the Front. Both women advise executives on strategy, organizational development, and talent management initiatives. Courtney and Angie are also Directors of the Center for Creative Leadership’s Partner Network, a premier organization for thought leading consultants, executive coaches and trainers. Courtney holds a BA from North Carolina State University and a JD from William & Mary Law School. She served as an officer in the United States Marine Corps. She resides in Richmond, VA, with her husband and three children. Angie holds a BA and MBA from the University of Michigan. She served as an officer in the United States Marine Corps. She resides in Traverse City, MI, with her husband and two children. Sean Lynch is a senior consultant at Lead Star and specializes in designing and delivering leadership programming. He holds a BA from Yale University and served as a fighter pilot in the United States Air Force. Sean resides in Bradenton, FL, with his wife and two children.